Day 1: Pick-up from your hotel in Beijing at 7 am or earlier in the morning if you wish. Drive 2 hours to the foot of the wild great wall. starting to climb the 3 sites of Jiankou section of the great wall - 'Beijing knot' where three wall connect to one point , 'eagle fly upward' where it is 80 degree angle but a small trek and go around it , 'heaven ladder' where the wall is narrow and long going up like a ladder to heaven . 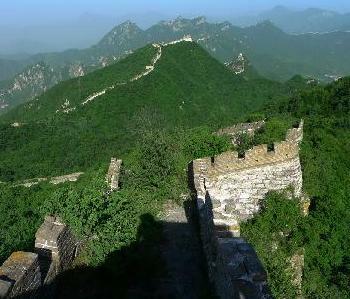 we have lunch on the great wall , I prepare egg and bread and even cook some noodle . At about 3 pm we come down the mountain and rest in the nice farm house and have Freshly prepared dinner served by rural attendants. Evening discussion among new friends and then to sleep. Day 2: Wake-up call by the crow of the rooster-about 7:00 am Breakfast served by attendants and completed by very early morning. Hike up the mountain to the wall. 5 hours in a single direction. Hike down the mountain and back to the staging area; Along the this part of the section there are another 3 sites which are 'Small budala' - the great wall looks like the budala in Tibet ; another site is 'arrow bow' the wall shapes like a upside down bow ; the third site is 'North tower' it is the top summit beacon tower of the Jiankou section of the great wall , and it is the biggest , it faces north so it is named the 'North tower' . at about 2:00 pm in the afternoon we drive to the Mountain resort to have delicious lunch , we can catch live trout and the restaurant will cook the fish for us , there are also various vegetable and meat . 4:00 pm we start to drive back to beijing. What I offer is certainly off the beaten track. Few persons ever go where I am about to take you. I am local Chinese, and your adventure is the result of my expertise in planning, driving, hiking, and language. As Your China Guy I will fully take care of you. The only thing left is the memory of this alternative experience that will last your entire lifetime! 1. Round trip transportation to the wall with hotel pick-up and return. 2. Overnight accommodations in a remote setting with dinner and breakfast. 3. Fully guided trip up the mountain, on the wall, and then back down. Late afternoon stopover at a mountain resort for you to catch your own trout and have it prepared for a late lunch.